Log in to the Staff Portal that has been launched through your database or remotely. See Launch the Staff Portal. 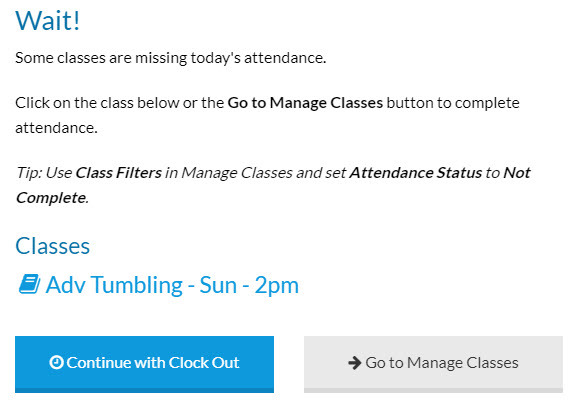 Navigate to the Manage Classes tab to view your classes. As a default, the current day's classes are displayed. Use the Class Filters to display different classes as needed. Select the Attendance button next to the class that you are working with to open the Attendance page. If the class displays a green check mark on the main page, attendance has already been completed. If your Staff Portal settings allow for partial attendance, an orange check mark indicates that class attendance has been started, but not completed. Select either Present or Absent for each student. Use the All Present or All Absent buttons to quickly complete attendance for a full or empty class. The Undo button will back out any changes made since the last save. The Return button will take you back to the Manage Classes main page. For students who are marked present you have the option of adding attendance details noting whether the student was late for class, left class early, or was just observing class that day. 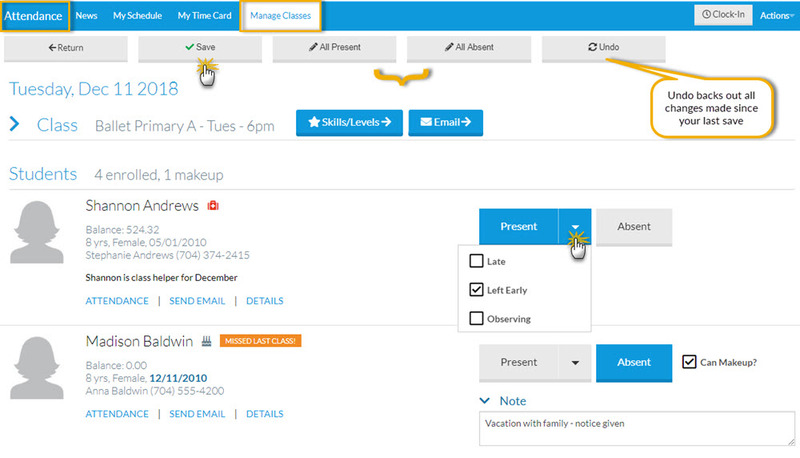 Use the arrow next to the Present button to drop down the attendance detail options; select all that apply. A badge will display under the Present button for each option. These attendance details can be displayed on the Student Attendance Report. If your database is set up to track absences, and you allow makeups, a staff person taking attendance can mark absent students as eligible for a makeup class. Note: The staff person must have Allow this staff person to mark absent students eligible for a make-up class? set to Yes on the Portal Settings tab of their Staff record. A Can Makeup? check box will display for each student marked absent. If the student is eligible to make up the missed class, select this check box and add a note if needed. This note is viewable on the Absences tab in the Student record. If the student is not eligible leave the Can Makeup? check box clear. A note can be entered to indicate why the student was not eligible to make up the class. If partial attendance is permitted (Staff Portal > Settings > Portal Settings > Attendance Options) you can Save at any time so that you can complete attendance later. This is helpful when you want to take attendance as students come in and you need to manage other classes at the same time. These classes will be marked with a orange check mark to indicate partial attendance. If partial attendance is not permitted, you must mark every student as either being present or absent before you are able to save the changes. A warning will display if you have not completed attendance and you will not be able to save; students who have not been marked as present or absent will be highlighted. Return to the Main Attendance page to locate any classes with no check mark or an orange check mark. Select the Attendance button to complete marking the students present or absent and Save. A staff person, who is allowed to enter attendance and is set to the Time Entry Method of either Clock In/Out or Manual In/Out (Staff record > Portal Settings tab), will receive a warning if they attempt to clock out when they still have classes that need to have attendance completed. 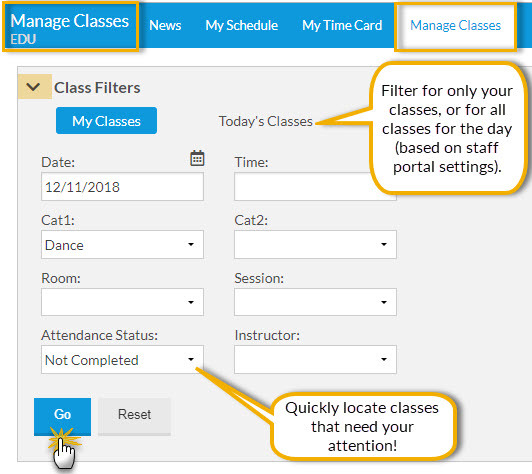 Use the Attendance Status Class Filter set to Not Completed to quickly located the classes that need to have attendance completed.